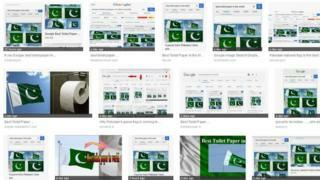 Google searches for "best toilet paper in the world" appear to have been manipulated to return images of the Pakistan national flag. The flag-toilet paper connection emerged soon after the 14 February attack in a few blogs commenting on the attack and became a trending topic on social media over the weekend. The number of people searching for the connection may have also influenced how Google returns results. Now a Google search returns news stories about the link but anyone searching images for the "best toilet paper in the world" gets a page dominated by the green and white flag. Many of the images are from news stories about the connection. Others are screenshots of the critical social media posts that linked the flag to toilet paper. Google has not yet commented on how this could have happened. This is not the first time that a search via Google has returned curious results. Heads of state including US President Donald Trump and Indian Prime Minister Narendra Modi have both been linked to searches for derogatory phrases. Google has called into question why the image involved has appeared high in its results. "While we continue to investigate the matter, we have not found any evidence that Google Images was ranking the Pakistani flag in response to this particular search," said a spokeswoman. "Many news outlets wrote about an old screenshot from a meme website that is inconsistent with our UI [user interface] and dates back to 2017, and we have not seen any independent verification that these results ever appeared as depicted. "Since these news stories published, images from those articles are now ranking for this query, as the pages contain words relevant to the search."